Visitor: Ambassador Melissa Hitchman. Photo: Mark Bowling. AUSTRALIA’S first resident woman ambassador to the Holy See Melissa Hitchman has described Pope Francis’ papacy as a “unique moment in history”. 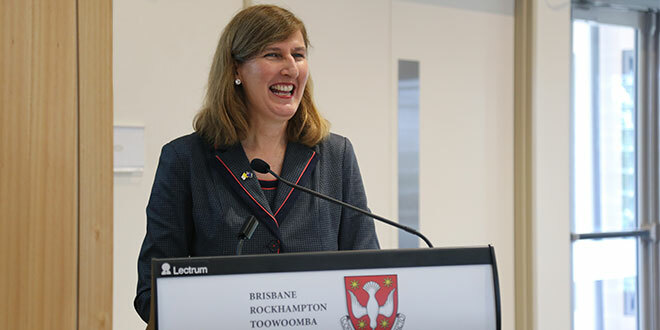 After briefing the Federation of the Catholic Bishops Conferences of Oceania, Ms Hitchman flew to Brisbane, where she spoke to clergy and seminarians at the Holy Spirit Provincial Seminary, Banyo. “I have come directly from the Oceania bishops’ conference in Port Moresby … and I was the only woman in a room of about one hundred men there, and I think if I did nothing else, I achieved that,” she said. It was part of a speech, in which the career diplomat and mother described her efforts to lift the profile of Australia’s Holy See mission, encourage the participation of women and promote indigenous culture. Introducing her speech, Brisbane vicar general Monsignor Peter Meneely said he believed it was the first time an Ambassador to the Holy See had officially visited the archdiocese, let alone the seminary.